My steering had been getting pretty sloppy. I routinely get underneath my Xterra to check out the front end, trying to make sure everything is tightened up. While I have a beefier steering kit installed, I was still finding too much play in the wheel. Upon searching, I found that Nissan's have a steering box bolt that can be used to adjust the worm gear. Access can be made through the hood but is much much easier through the wheel well if you peel back the rubber flap. On top of the box is a reverse threaded 5/8th nut with a allen bolt in its center. While keeping an 3/16 allen wrench on the bolt, losen the outer nut. You may then tighten the allen bolt while keeping the nut still. 1/4 turn on the center is the recommended start adjustment with subsequent turns to follow if need be. I probably got 3/4 on mine to where I liked it. I then held the allen bolt still and retightened the outer nut. You can test it out now to see if the slop you wanted out is gone. Overtightening will cause stress and wear on the gear so be carefull. Does Nissan use a Saginaw steering box? The xj steering box is Saginaw and has a similar/same adjustment by following your instructions. A quick search did not reference that manufacturer with Nissan parts so I am not sure. 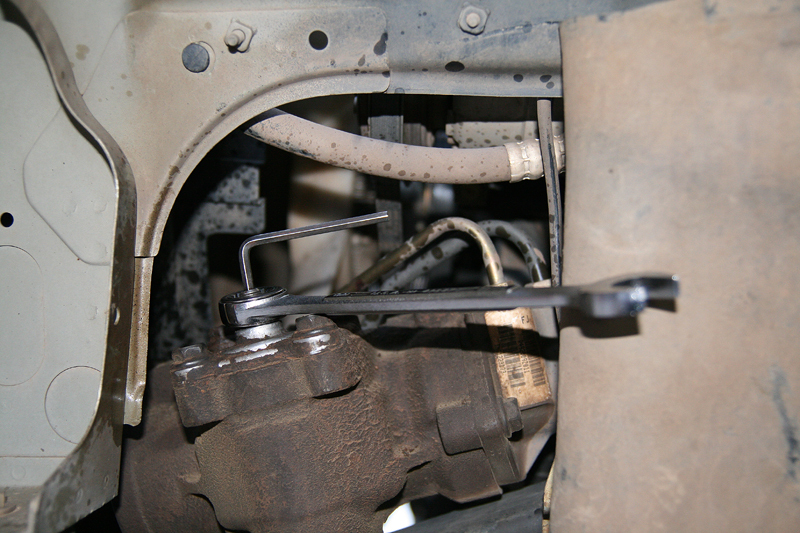 I typed: xterra steering box adjustment - into google today. First hit was this article. I don't even remember documenting it. Jonathan was under the impression that his box had to be pulled to try the adjustment and his Jeep is all over the road. I followed Matt's link and sure enough, Jon's can be done on vehicle. Now his steering is great again. Note: Nissan's was reverse thread nut. Jeep's is regular thread.